Giving without expectation is a valuable tradition to instill in young children, and helping children learn the joy of giving firsthand is one of many ways we nurture important character traits in Primrose students every day. 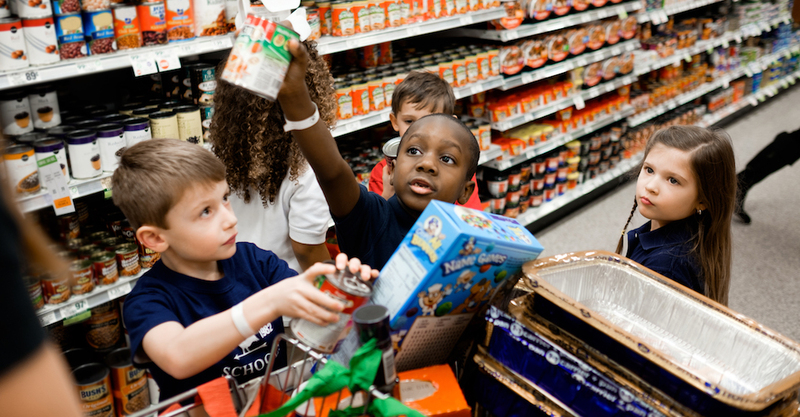 Every year, nearly 400 Primrose schools across the country participate in our Caring and Giving Food Drive. 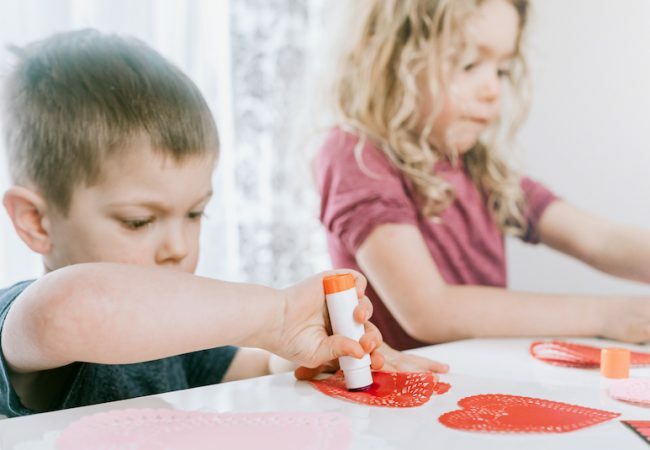 Through this program, schools and parents work together to bring important character lessons full circle, helping children practice concepts like generosity in authentic ways. Primrose School of Avon: The school partnered with their local TV station, Cleveland 19, to take part in the “Share Your Holidays” event, a community-wide donation drive to benefit Second Harvest Food Bank of North Central Ohio. Families and staff collected 1,200 pounds of food to feed thousands in their community. The local TV producer even wrote the school to thank them for their generous donation! Primrose School at Stapleton: Students, staff and families worked together with 24 other schools in Colorado to collect 20,000 pounds of food and supplies for the Food Bank of the Rockies. Children from the schools helped load several buses’ worth of donations. The school has partnered with the Food Bank of the Rockies for more than 15 years and tries to exceed their goal every year. Read more here. Primrose School of NW Oklahoma City: The school’s families donated more than 1,200 pounds of food to the local food bank as part of their Caring and Giving efforts. Students also visited the food bank to learn more about how the donations helped the community. Primrose School of Noblesville: Students at the school had a great time doing good! As part of their Caring & Giving food drive, the school hosted a competition between classes. The class with the most canned goods collected got to spray the School Owner and Director with silly string. The Kindergarten class won! 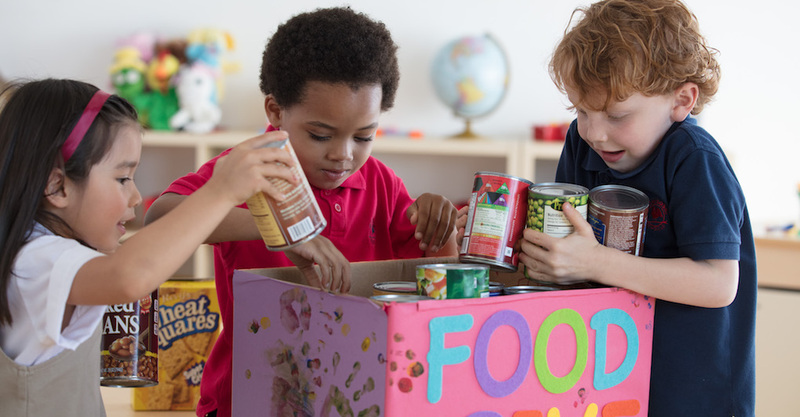 Primrose School of Centerville: In preparation to purchase canned food items for the Dayton Food Bank, children raised money by completing extra chores at home. They compiled what they earned, created a shopping list and took a special field trip to the grocery store to pick out food to give families in need a holiday meal. Primrose School of Rogers at Pinnacle Hills: The school raised more than $1,200 and hundreds of nonperishable food items for The Samaritan Community Center. Children in the Explorers Class used the money raised to purchase more canned goods and 36 turkeys for families in need. The Samaritan Community Center ran out of turkeys just before children from the school arrived with their donation. We hope these examples spark some ideas on how you can give back to your community. Learn more about tips for developing positive character traits in your child here!